Another one purchased used in the mid-to-late 80s, just because it looked interesting. You won't find these guys on Wikipedia, but fortunately one of the members, Steve Acker, has a website which includes a section on The Story of LAW. So everything I know about them, I read there. One of most popular area bands throughout the 70s was Youngstown, Ohio’s LAW. Formed in February 1971 by Steve Lawrence, Steve Acker and Mickey Williamson, the name was derived from their initials. From the band’s first rehearsals it was clear that LAW had a special chemistry and magic which very quickly garnered them a regional reputation as an exciting and original club and concert attraction. At the outset the band was determined to perform original material with the goal of securing a record contract. Even the cover songs they did were performed in their own original style. LAW was known as a “boogie band.” A three piece power trio, they were quite similar to Z.Z. Top in performing blues-based hard driving rock, although they did not know it at the time. Within a year of their formation LAW was opening for national acts like Bob Segar, Edgar Winter’s White Trash and Alice Cooper. One notable performance took place outdoors at Lake Milton, Ohio before 5,000 fans. LAW not only opened the star-studded program, but also later performed as Chuck Berry’s backup band. I call this one GA10017 because that's the catalog number and the only apparent title of the album (it's printed on the lower hand cuff, as well as on the spine). They later developed into a 4-member band with Acker as the only original member. Click the image to the left you and can see an enlarged version with the members' names as they were in 1975. 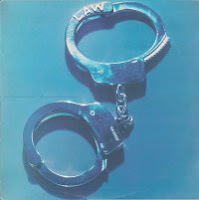 In 1975, LAW had a hard time breaking into radio because they were too funky for AOR and too rock for R&B. They opened for many different headliners (perhaps most notably The Who--Roger Daltrey liked them a lot), but were never able to become a headliner themselves. The band shown here consisted of guitar, bass, drums and keyboards. An additional percussionist and synth player are credited but not pictured. The Memphis Horns also add great accents throughout the album. This is a cool album, and the more I listen to it, the more I like it. They released two other albums, and if I ever chance across them, I'll certainly consider buying them. Ripping results: perfect, with some work. You can download and listen to many LAW mp3s at Acker's website, just click LAW Songs.